Love your pooch and want the absolute best for them? Getting a healthy, nutrient-packed food for them is one of the best ways to help them to live a long, healthy, and happy life. Unfortunately, most healthy dog foods are really expensive. So we went on a hunt for the best healthy cheap dog food we could find to make sure man’s best friend can eat great on a budget. We used a few things to make sure that each dog food was the perfect food for our furry babies, and we’ve outlined each of those stats here for you. Food Type - Is this food wet, dry, or raw? Depending on the age, breed, and preferences of your dog, you may prefer one of these over the others. 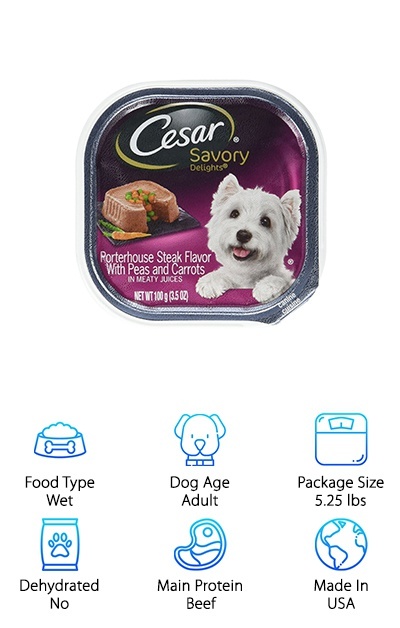 Dog Age - What age of dog is this food meant for? Make sure that the formula is made specifically for your puppy, senior dog, or full-grown dogs. Package Size - How much comes in a container of food? We will measure this in pounds. 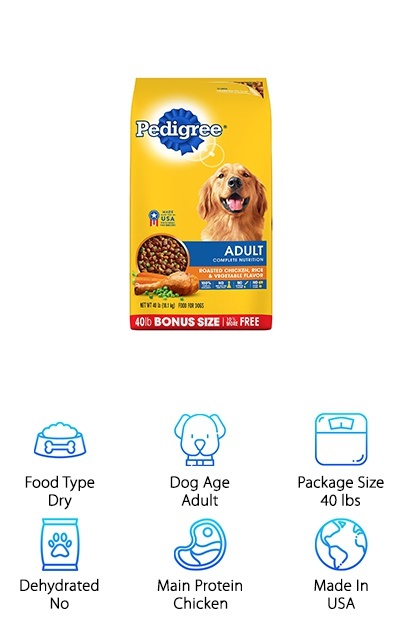 The number of servings will depend on the size of your dog. Dehydrated - Is the food dehydrated? Some foods require that you add water for it to be complete. If water needs to be added, you’ll see a “yes” for this stat. Main Protein - What is the main source of protein? We’ll let you know what animal, blend of animals, fish, or plants make up the main source of protein in each food. Made In - Knowing where your dog food was made can be important. If you are looking for a certain location for your food, check here for more information. Now that we’ve gone over the important stats for each dog food, we’re almost ready for our top ten list of the cheap healthy dog foods that we love. First, let us tell you about the list. We loved all ten of these products (and we’ll tell you all about them! ), but there were two products that really stood out from the rest of the pack. These two will be located in the first and second spots on the countdown. They are our Top Pick and our Budget Pick for the best cheap dog food. If you are in a hurry, you should definitely check out at least those two. Although we think you’ll love them all! Now, onto those cheap dog food reviews! In the world of good, cheap dog food, we think that Pedigree Complete Nutrition is tops! If you’re looking for a food that is great for any breed or size of dog, then Pedigree Complete Nutrition is a great way to go. It comes in a variety of sizes and all are pretty inexpensive. This delicious food is made from chicken, whole grains, and veggies, making a complete and healthy meal for most adult dogs. It gives your pup all of the omega-6 they need to give them a shiny, healthy coat of fur. It also provides fiber, antioxidants, and vitamins too. But as much as we love the stuff in the Pedigree Complete Nutrition, we love the stuff that’s not in it as well. No high-fructose corn syrup, no added sugar, and no artificial flavors! One of the cheap dog food brands that really stood out from the pack is Purina! 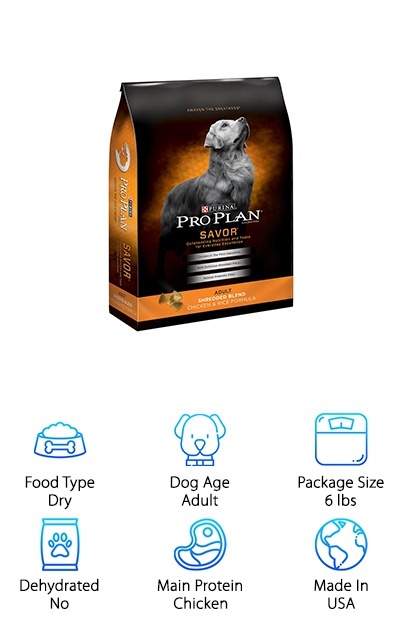 And our favorite of their yummy, nutritious dog foods is the Purina Pro Plan Shredded Blend. This chicken-based food also features easy-to-digest rice. Chicken is the first ingredient in this super inexpensive dog food, and it contains plenty of fiber for your dog’s digestive health. Although we’re reviewing the 6-pound bag here, this dog food also comes in 18, 35, and 47-pound sizes too. The food is half kibble and half shredded pieces to provide a plethora of textures for your pooch. And this amazing food as real complete nutrition, giving your dog the fiber, vitamin A, linoleic acid, omega-6, and protein they need. So if you’re looking for complete nutrition for your dog without breaking the bank, check out the Purina Pro Plan Shredded Blend. Looking for a great wet dog food for your best friend? 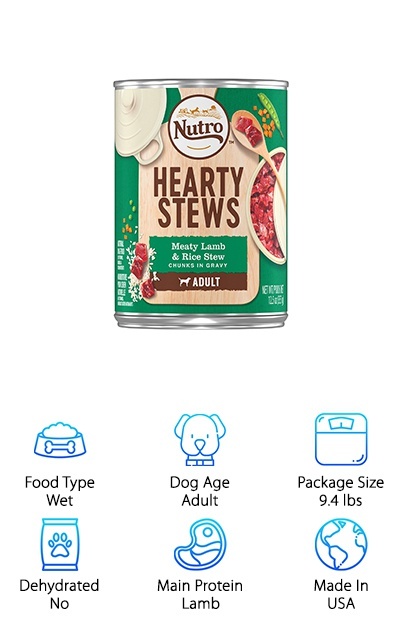 Nutro Hearty Stews comes in an easy-to-open can. The food is a stew of some of your dog’s favorite flavors, like chunks of lamb, rice, and gravy. It’s a cheap, good dog food that is crafted to give your dog everything they need to be healthy and happy (including delicious, meaty flavors!). The all-natural ingredients are carefully sourced from a network of carefully vetted farmers and suppliers. Nutro wants to make sure that your dog’s food is as healthy and delicious as possible! It provides complete, everyday nutrition for your adult pup without soy, meat by-products, artificial flavors, or preservatives. So if your dog needs a wet, protein-rich, easy-to-digest food that satisfies and tastes great, then check out the Nutro Hearty Stews! Looking for a great wet food formulated especially for your small, adult dog? Cesar Savory Delights come in a variety of flavors, but we really love the beef varieties! The packages come with 24, 3.5-ounce trays. All of these little cups are a complete meal for your small pooch. They are all flavored with meats and filled with veggies to help give all of the vitamins, minerals, proteins, fats, and everything else they need to lead a healthy life. Each serving is sealed in individual portions, making serving and keeping them fresh as easy as pie. And, if your pup likes a little variety in their diet, it’s easy to get combination packs or a variety of flavors for a low price. Your furry little buddy will love you for it! Rachael Ray doesn’t just make delicious food for humans! 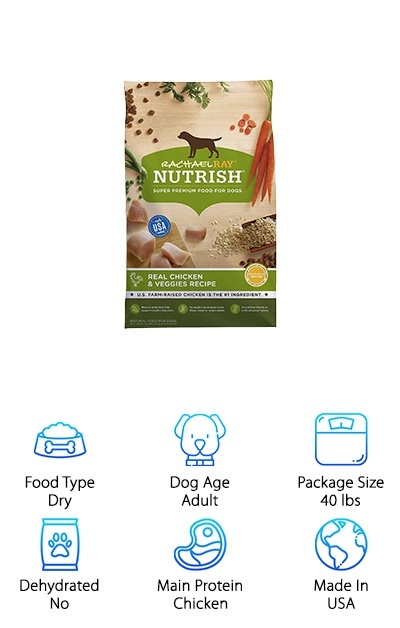 The Rachael Ray Nutrish Dry Food is great for your canine buddies; the ingredients are easy-to-read and are filled with all sorts of delicious and healthy things for your pooch. The first thing on the label is farm-raised, USA-made chicken. It also has carrots, peas, and brown rice, all healthy and yummy things your dog will love. And it’s good for them! This dog food contains no fillers, no wheat, no artificial flavors, and no artificial preservatives either. The best part? Rachael Ray Nutrish Dry Food contains natural prebiotics to help your dog’s stomach and aid in digestion. It also comes in a variety of sizes, ready for your furry friend no matter what size they are. So if you love Rachael Ray’s recipes for people, you should give Rachael Ray Nutrish Dry Food for your dogs a try! Are you looking to buy cheap dog food online that supplies healthy proteins through fish instead of meat? 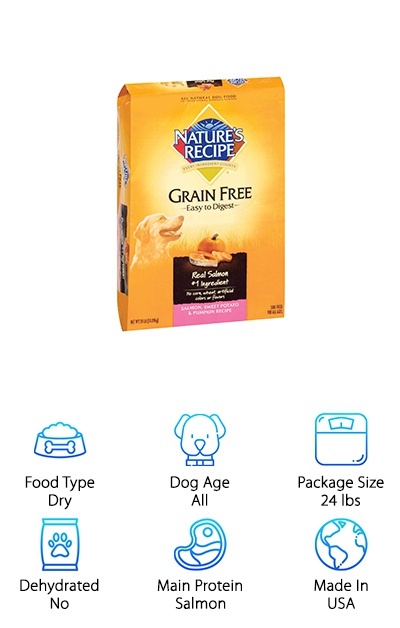 Unlike most of the other dog foods on this list, Nature’s Recipe Grain-Free gets its proteins from nutrient-rich salmon alongside pumpkin and sweet potato for a healthy, rich meal that dogs just eat up! This food comes in a variety of sizes too; you can get small ones for your tiny dog or big bags for your big dog. All at a reasonable price, too! This food has no wheat, no corn, fillers, grains, or beef, making it easy to digest. This food is formulated for all size pups, all breeds of dogs, and even ages. So whether you have a big puppy or a tiny senior dog, or anything in between, your pooch will get a full, nutritious meal! 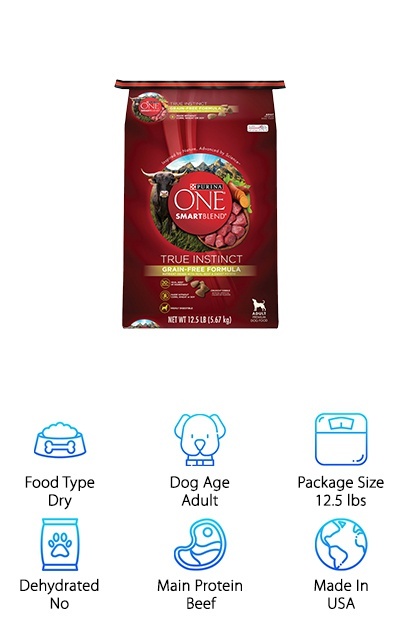 If you’re wanting some of the cheapest grain-free dog food for your pet, Purina One SmartBlend is a great place to start. Made with real beef and sweet potato (also available is chicken and sweet potato), it comes from a brand you probably already know and trust. Purina has been making great, cheap dog food for more than 80 years, focusing on giving your dog yummy, healthy meals made with meat as the first ingredient. Purina One SmartBlend is grain-free, corn-free, soy-free, and made with real beef. It’s also made with artificial flavors or colors. It has 30% protein to make sure your pup can have the active lifestyle they deserve. And it has all of the antioxidants and glucosamine they need to help them keep going! Want a wet, canned dog food that’s formulated for your pup? Whether you have a picky eater, a puppy, a senior dog, or a small breed dog, Blue Freedom has a delicious wet food that’s great for your dog. This food, the Blue Freedom Grillers Wet Dog Food, is a wet food that has grilled meats right in the can. This particular flavor is made mostly of turkey. It has no by-products, no corn, no soy, no wheat, no grains, or anything artificial. It features limited ingredients and all-natural goodness that your dog will eat up. It’s super healthy, inexpensive, and comes in two conveniently-sized cans. It limits ingredients that can be allergens or cause digestion issues in your pet. And the first ingredient is turkey, giving your pooch all of the high-quality proteins to build healthy muscles. 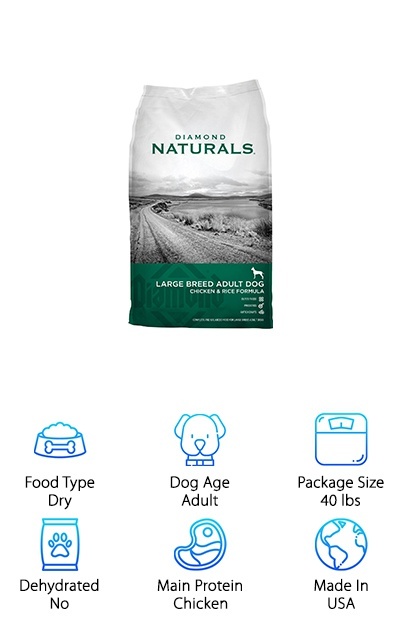 Filled with great vitamins, minerals, and other good stuff your dog needs, Diamond Naturals 60+ Formula is one of favorite cheap pet foods that you can buy. It’s made in the USA and is made from mostly chicken and rice that are easy to digest. The list of ingredients is pretty short and filled with all of the things your dog’s body needs to be a healthy, active adult. It also comes in a lamb and rice variety. This all-natural formula is made for 60-pound and bigger dogs. Made in the USA, Diamond Naturals 60+ Formula helps your big dog to have plenty of protein, healthy joints, healthy digestive system, and a shiny coat so they can enjoy an active lifestyle. So if you have a big, adult pooch that’s always ready to play, Diamond Naturals 60+ Formula is an awesome food for them! 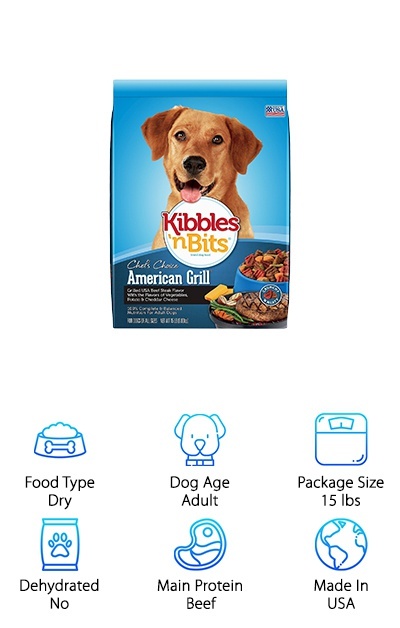 The yummy, healthy Kibbles ‘n Bits Grilled Steak is ready for your adult dog of any size. It comes in a couple of sizes, great for either small or big dogs. This food is made from kibble mixed with little pieces of bites that taste like meaty chunks right off of the grill. The Kibbles ‘n Bits Grilled Steak is made from delicious ingredients like beef and beef stock, ground corn, peas, potatoes, and added vitamins and minerals. It’s made in the USA from yummy ingredients to give your dog a healthy diet. It even has a touch of cheddar cheese to give your dog that off-the-table flavor that your dog will probably love! It’s a filling and healthy meal for your dog every single day.